Luxury fashion house Maison Margiela has released its Puffer slipper shoe in new colorways for the Fall/Winter 2018 season. This cozy slipper model features a waterproof, quilted nylon upper, drawstring fastening at the top, and a curved, crêpe gum sole. The Synergy Glyph - "a symbol unifying several codes into one single language," according to the label - is stamped near the top in a contrast hue. Now available in black, white and blue, the Maison Margiela Puffer Slipper shoe is out now for $545 USD at Maison Margiela's web store . Maison Margiela has released two color options of its PVC-Coated Leather Tote Bag in black and beige. The new luxury piece fuses a prevalent accessories trend - PVC tote bags - with the brand's iconic garment label motif, which sees the number 11 appropriately circled for the accessories category. 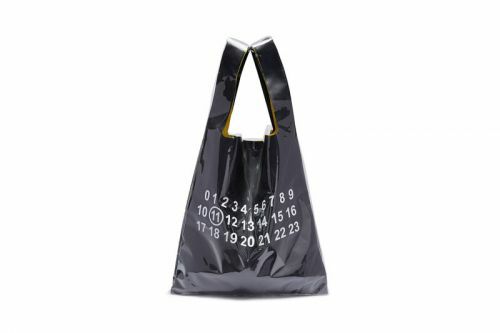 This tote bag features a calfskin leather base layer with contrast interior lining, coated with a clear PVC layer featuring the famous garment label numbers in white. The inside of the bag includes an actual Maison Margiela garment label stitched near the top and a matching zip pouch.